It seemed like a mid-January alignment of planets occurred in Phoenix, Arizona with immigration reform events, a human rights march protesting Sheriff Arpaio, and the “Dream Act” play coalescing over a period of a few days surrounding this Dr. Martin Luther King, Jr. holiday weekend. The Unitarian Universalist Congregation of Phoenix (UUCP) and fellow UU congregations from the Valley of the Sun and Tucson, Arizona were busy in planning, participating in, and hosting the activities, along with interfaith allies, immigrant rights groups, and advocacy partners. The Social Action Committee of UUCP and First Congregational United Church of Christ in Phoenix commissioned New Carpa Theater Company, a Phoenix company focusing on Latino and multicultural theater works, to present the “Dream Act” play at UUCP and First Congregational United Church of Christ of Phoenix on January 15th and 17th. “Dream Act,” written by James E. Garcia, tells the story of undocumented student Victoria Nava and her dreams of practicing medicine. In the face of anti-immigrant sentiment, she feels her dreams may be slipping away. The play is based on an National Public Radio interview of an undocumented student in Southern California and brings to life the plight faced by the 65,000 undocumented immigrants who graduate from high school each year. “Dream Act” was well attended by people from inside and outside the congregations including administrators, teachers, and students from several schools that teach many undocumented youth. Immigration reform activist groups CADENA – DREAM Act Arizona and Reform Immigration for America (RIFA) handed out information at booths. Each performance was followed by an interactive discussion session led by Mr. Garcia with experts on the proposed DREAM Act legislation and members of the cast. On January 16th, thousands of people, including immigrants and immigrant rights organizations, church groups, advocates and anarchists, filled the streets outside Maricopa County Sheriff Joe Arpaio’s jail for the March for Human Rights. 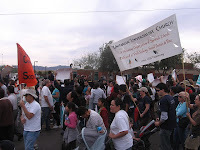 The march focused attention to stop human rights violations, racial profiling and use of 287(g) by Sheriff Arpaio and other entities in the State of Arizona. 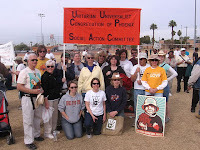 UUCP Minister Reverend Susan Frederick-Gray, several UUCP members and other UU’s from the Phoenix and Tucson area congregations rallied and marched with UU banners and Standing on the Side of Love t-shirts in prominent display. Rev. Frederick-Gray spoke at the rally calling for all to “Stand on the side of love with immigrant families.” Members of UUCP and others worked with local Latino and Indigenous Peoples activist group Puente Arizona in the planning of the march. Marchers can assure you that despite some media stories you may have seen, the vast majority of people involved were peaceful and respectful of police monitoring the march. UUCP’s Immigration Task Force has partnered with the Arizona Advocacy Network (AAN) and RIFA Arizona in ramping up attention on comprehensive immigration reform and has crafted a presentation to be taken throughout Arizona. The presentation is based on recommendations from RIFA and explains that many present immigration practices are unrealistic—we cannot deport 12 million people even if we wanted to(!) and that through our shared values we can work together to protect and value ALL families, including immigrant families. The task force also participated in a RIFA press conference outside Senator John McCain’s Phoenix office on January 14th calling upon McCain to continue his support of immigration reform. RIFA Arizona is holding a Town Hall on immigration on January 19th focusing on the faith and business communities. Members of the task force will participate and some are scheduled to speak. I feel proud to stand up with my faith and interfaith community in partnership with immigrant organizations for human rights and justice. Si Se Puede!